Einstellung‘s acoustic kraut/post-rock gig at the Old Joint Stock Theatre last week got a great write up in the Birmingham Post. Justly so. It was very good. 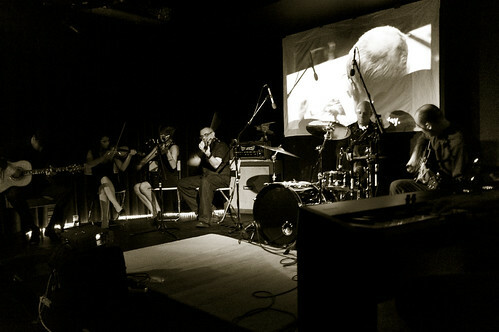 The addition of strings seemed to suit the quartetâ€™s reworked arrangements perfectly. Much like their usual incarnation, mellifluous guitar lines duelled and intertwined, although much more subdued than usual, nevertheless snaking between the rumbling bass while motorik rhythms (on this occasion played with brushes for the requisite subtle mood) provided the signature krautrock theme, even without the nominal searing guitars. Some good news for those who couldn’t get tickets for this sell out show. The recording has come out really well. Looks like it will see the light of day in some form. Einstellung will be back to their full-bore powerkraut best in the autumn. I saw you supporting The Nightingales at The h/h in Kings Heath.Great gig .Unfortunately didn’t have money to see you at O.J.S. Back in London through problems and am sleeping on streets. Let us know if you are playing down here and i’ll try to get a crew together.